Have you ever thought, “I wish The Shining was weirder, scarier, and more intense—and also had more synthesizers”? We can’t imagine many have, but in case your nightmares aren’t visceral enough, a video from Richard Vezina envisions what The Shining would look like had another auteur, David Lynch, directed it instead of Stanley Kubrick. Blue Shining (Kubrick x Lynch) from Richard Vezina on Vimeo. The video mashup “Blue Shining” overlays and inserts scenes and images from Wild At Heart, Blue Velvet, Lost Highway and more into the 1980 Kubrick classic. For example, Twin Peaks’ ubiquitous logging trucks roll by outside the office window as the violent history of the Overlook is explained to Jack Nicholson’s Jack Torrance, and Eraserhead’s Lady In The Radiator is doubled to replace the ghost twin girls at the end of one Danny Torrance’s rides through the hotel’s hallways. The video also intensifies the already intense sonic landscape of The Shining with songs and overblown sounds from Lynch’s oeuvre. His surreal visual style is also replicated, with closeups of Nicholson slowed down and distorted even more—not unlike some of the violent, climactic moments in Mulholland Drive and Blue Velvet. The eight-and-a-half-minute video originally came out over a year ago, but the upcoming return of Twin Peaks had us hungry for some Lynchian abstraction. Vezina’s created more of a reinterpretation than the kind of straight juxtaposition or recombination of sounds and scenes that one finds in so many similar videos. 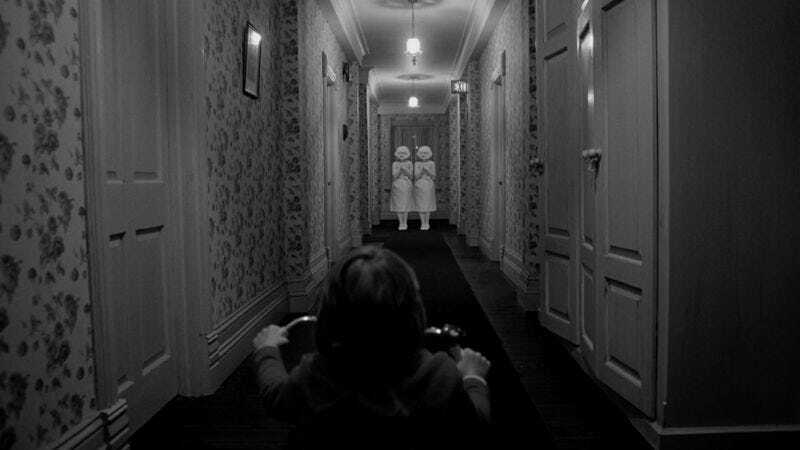 As with any Kubrick or Lynch, we wouldn’t recommend watching it before bedtime.